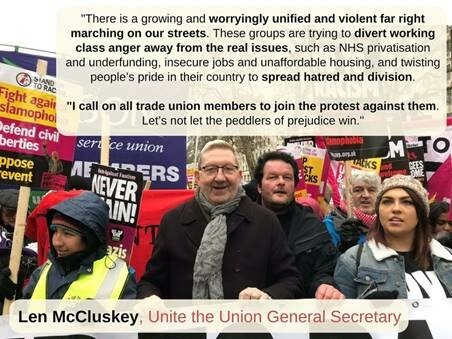 There are two political protest events coming up which have wide support from the Trades Union movement including UCU. The first is on Friday the 13th of July to oppose Donald Trump’s visit. The second is to oppose racist and fascist groups, with a focus on Stephen Yaxley-Lennon, also known as Tommy Robinson, a former leader of the EDL with links to other vile organisations such as Pegida and the so-called “Football Lads Alliance”. A man even Piers Morgan has condemned as a “a bigoted lunatic”. Since his imprisonment in May “Free Tommy Robinson” has become a rallying cry of the far right. The Anti-Trump Protest is on Friday 13 July 2pm Portland Place, London W1A 1AA followed by a rally at 5pm in Trafalgar Square. Please be there to show Trump he is not welcome and that we in the UK trade union movement oppose his divisive and racist policies. There are coaches available from Nottingham, and Derby and further information at the Stop Trump website. The Stand Up to Racism ‘Oppose the Nazis and Tommy Robinson’ event is on Saturday 14 July 2pm Whitehall, London SW1A. It is vital we mobilise against the pernicious ideology peddled by Tommy Robinson and his friends in the so-called Football Lads Alliance. Further details on the Stand Up To Racism Facebook page.